My name is Meghan Chase. In less than twenty-four hours I'll be sixteen. Countless stories and songs have been written about this wonderful age, when a girl finds true love and the stars shine for her... I don't think it will be that way for me. Something has always felt slightly off in Meghan's life, ever since her father disappeared before her eyes when she was six. She has never quite fitted in at school... or at home. When a dark stranger begins watching her from afar and her little brother is thaken, Meghan senses that everything she's known is about to change. She could never have guessed the truth. Meghan is the daughter of a faery king and a pawn in a deadly war. Now Meghan will have to choose between a normal life and her magical destiny - and between her best friend and a darkly dangerous prince. It's time for Meghan to enter the faery world. First and foremost: the comment "The Next Twilight" on the cover, is in my opinion completely ridiculous and totally inappropriate. Was it really necessary to disfigure the otherwise beautiful cover by this monstrosity? Because admit it: the cover is a work of art. And then there is that ugly blue circle with that ridiculous comment in it. This book is nothing like Twilight and I say this as positive comment. This book is 10 times better than Twilight! When I think about the Twilight books the definition I come up with in my head is mainly: "instant swooning love" and "vampires and werewolves". 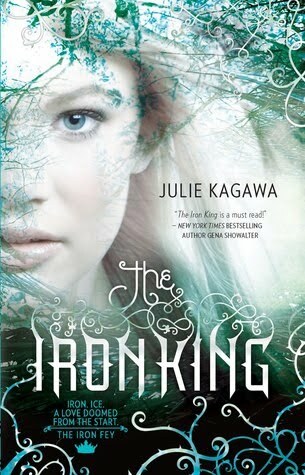 The Iron King is much more subtle and has a much lighter theme. The love in this book is not instant, or swooning, but rather read between the lines. Get rid of that ridiculous circle on the cover! Megan Chase, the main character is 16 years old, and thank goodness, finally a writer who can describe a perfect sixteen-year-old! Most other sixteen-year-old characters in Young Adult books seem to be mentally 20 or older. Megan is an adolescent and it shows! Her reaction to the Fey world, the truth about her origins, is hilarious and very realistic. More realistic than in most YA fantasy books I've read. Julie Kagawa has a pleasant writing style, it was not hard to read this book from the first page to the last in just a few hours. It reads smoothly and without too many annoyances. The author is very good at describing landscapes, they come alive before your eyes. The descriptions are detailed enough, but not tedious, a perfect mix! The story has some exciting moments and certainly keeps your attention until the very last page. The idea for a third Fey Court to emerge from the technology and progress of mankind is a very original and cool idea and was worked out well. Ms. Kagawa clearly refers to the inspiration behind this book: A Midsummer Night's Dream. Part of this play, written by William Shakespeare, comes to life again in another context. I like this, the mentioning of another book and making it a part of the story, I like it a lot! • The repetitive mention that Ash looks or sounds bored starts to become very annoying. • The big kiss didn’t have the right timing in my opinion. It just felt wrong, not a natural reaction in their situation. Maybe it seems romantic to kiss a beautiful boy in the middle of a fight with a mechanical monster, but I would just want to get out as fast as possible instead of kissing with my boyfriend. • The history of Ash is a great contribution to the story, but when he compares Meghan with his long lost love, I was just speechless about her reaction. She did not mind this at all. I would be really angry deep down, because what woman would want to be compared with the ex? All in all a good book, I am more than satisfied and will definitely read other books by Julie Kagawa! I never noticed that! Kind of strange for the Winter princes to be named after trees, I would expect she would name someone from Summer like this :p Still, I loved this first book, but got a bit annoyed througout the others.